This website is the result of over 10 years spent trawling through microfilm at the State Library of Victoria (SLV) and countless hours online searching the Trove and Google News digital newspaper archives as well as the SLV's digital archive of the Football Record/AFL Record. It was born through a simple desire to get things right. 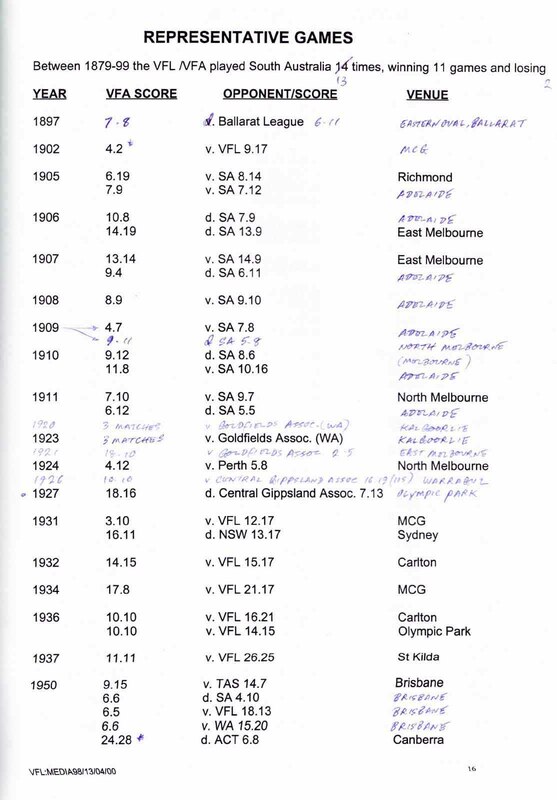 Back in 2000 a contact sent me a copy of the VFL Media Guide for that season which contained a list of "every" VFA-VFL representative match since 1897 (click here for a scan of this document). Not only did it omit arguably the most important period of 1879-1896, when the VFA was the governing body of football in Victoria, but it was staggering just how much information was missing from the recent past. It was only later that I would discover how many mistakes existed in the information that was there. Around the same period I stumbled on an old copy of the VFL Year Book from 1983 and some of the information within didn't quite fit what I'd read in the Football Record and other sources. In fact, some information seemed to be missing completely such as Victoria's captain in the two games against WA in 1929. The other representative games of that season were shown yet no mention was made of Carlton's Horrie Clover leading the state on the tour of WA - thus denying Clover recognition for his only games as Victorian captain. This led me to the State Library of Victoria's microfilm collection where a search of old newspapers started to expose further cracks. A search of the SANFL Book of Football Records (1990 edition) found even more. To be fair, Dion Hayman's book is an excellent resource but, as with so many other football books, it's what is missing rather than what is there that brings it undone. Research quickly showed that the list of South Australia's interstate team leaders was missing the names of at least five captains and a coach. I was continually frustrated at the footy history that should be freely available, but simply couldn't be found. Even more frustrating was the fact that digging for information tended to reveal problems with what had long been accepted as fact. However, despite amassing a mountain of information, a move overseas in 2010 put an end to my days of searching microfilm at the State Library and the project was temporarily shelved. It was the launch of the National Library of Australia's website Trove that made this site a reality. Their digitisation of old newspapers has made it possible for football fans like myself to delve deeper into the game's history, regardless of where we are located. 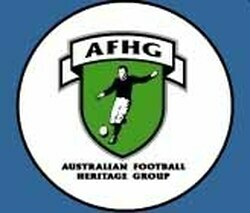 Australian football's history is now being steadily updated and revised as more fans develop an interest in the past. A recent example is the discovery by Supermercado (owner of the Demonwiki site) that Len Incigneri was Melbourne's coach in 1914, not Alex Hall as official sources continue to show. His research has revealed Hall was actually coaching Williamstown that season. Numerous examples of fact being fiction have emerged in my research, and no doubt, in the research of other football historians utilising Trove and the Google News archive.It is my hope that in time www.hardballget.net will become a trusted source for football fans to visit when they seek accurate historical information about our great game. David Eastman is a lifelong footy fan who detests rollercoasters yet chose to support the Melbourne Football Club. Throughout the torment of recent seasons he has drawn comfort from childhood memories of watching Robbie Flower soaring elegantly over a pack. Prior to relocating overseas in 2010 David could often be seen at the MCG, turning away from the scoreboard while uttering the mantra: "everything's zen". He is also a freelance writer and editor whose work has been published in print and online. Having researched the history of Australian football for over a decade, he has contributed to the popular footy websites www.footyjumpers.com and FullPointsFooty; this site marks his first foray into the shadowy and coffee-fuelled world of web design.